With times tables just around the corner, these creatively designed worksheets will give your second grader’s multiplication skills a helpful jumpstart. Colorful visuals help learners get started multiplying by learning how to add groups of certain numbers, while other kids discover that skip counting or creating arrays are their preferred strategies. Kids can learn and experiment with multiple methods until they find their multiplication groove. 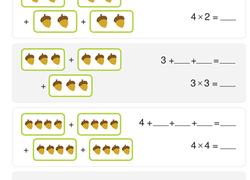 This fruit-themed activity will help your students connect repeated addition for 5's and 6's in order to see how multiplication works. It serves as a great visual for budding mathematicians, and kids will love adding up the different groups of fruit! Practise coloring in the arrays provided after reviewing what each factor in the multiplication sentence represents. This handy practise quiz helps kids review beginning multiplication. Help your child grasp multiplication by connecting it to concepts she already understands. If maths is becoming a monstrous subject for your child, give him some practise with these addition and subtraction word problems.